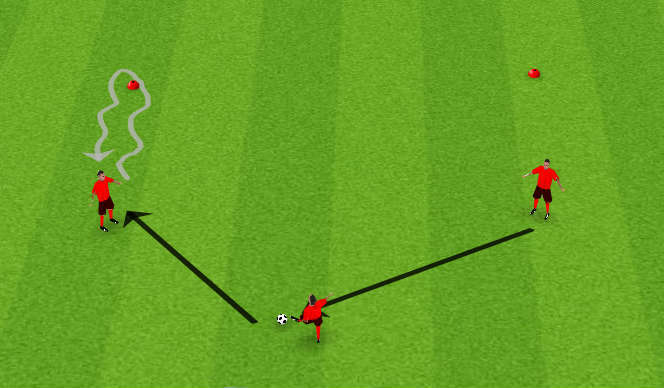 In 3&apos;s look at switching play and position of wide players off the ball. Wide-player receives and then take forward, turn and the players drop and open their body up looking to receive again.Work both sides. Key factors: wide players get ready to push forward. man in the middle has to open up body and keep shifting across. Work on playing into the number 10 but also switching around the back. 3 touch max. Rotate the three teams. The blues can not come into the grid. Only reds can score. 4 v 4 + 2 Floaters.1 touch finish, 3 touch max. Body position to open out, move across as a unit and create space, make the pitch bigger.